The GEQ Series RC Equalizers come with tantalum nitride resistive elements and silicon/oxygen/nitrogen capacitive elements. The units can be operated in -55ºC to +125ºC temperature range and are suitable for optoelectronic, telecommunications, broadband, military and electronic warfare applications. They feature 0.5 mm profile, 125 mW power rating, resistance values ranging from 10–50 Ω and capacitance values from 1–50 pF. The equalizers are offered in 0402 cases with 1 mm x 0.5 mm x 0.5 mm (L x W x H) dimensions. 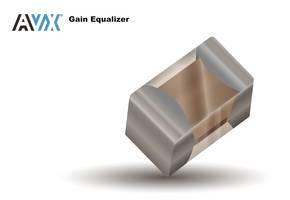 FOUNTAIN INN, S.C., Oct. 01, 2018 (GLOBE NEWSWIRE) -- AVX Corporation, a leading manufacturer and supplier of advanced electronic components and interconnect, sensor, control, and antenna solutions, released the new GEQ Series RC equalizers. These ruggedly constructed, ultraminiature (EIA 0402, 1005 metric) equalizers combine high-performance tantalum nitride (TaN) resistive elements and silicon/oxygen/nitrogen (SiON) capacitive elements with AVX’s proprietary, automotive-qualified, glass-sandwich FLEXITERM® surface-mount technology, which provides an extra measure of protection against flexure damage during installation. The new GEQ Series equalizers are also manufactured with 100% laser trimming to achieve tight tolerances and offer a low 0.5mm profile, a 125mW power rating, resistance values spanning 10–50Ω, and capacitance values extending from 1–50pF. For more information about AVX’s new GEQ Series RC equalizers, please visit http://www.avx.com/products/custom-thin-film-passives/rc-equalizer-network/. To order, please visit Mouser Electronics and Digi-Key Electronics. For all other inquiries, please visit www.avx.com, email inquiry@avx.com, follow them on LinkedIn and Twitter, like them on Facebook, call 864-967-2150, or write to One AVX Boulevard, Fountain Inn, S.C. 29644. PAM4 Validation Solution meets IEEE 802.3bs and OIF-CEI standard.